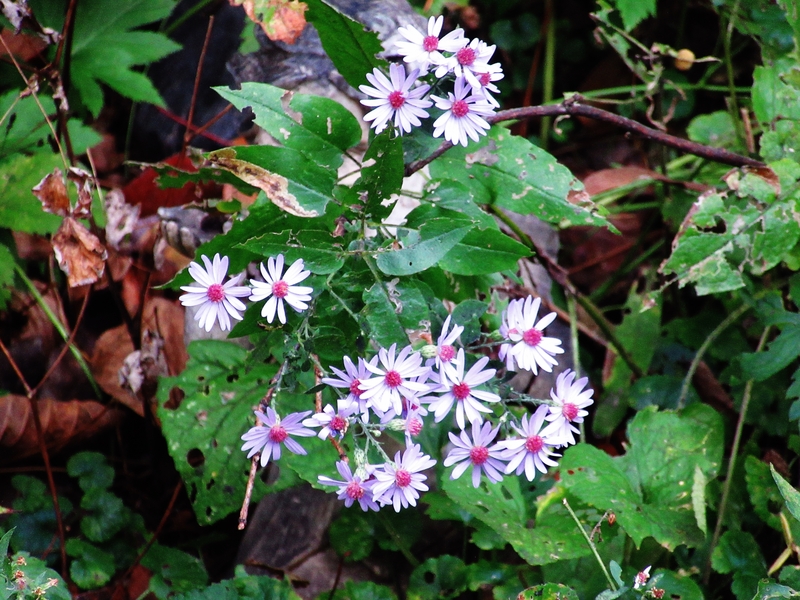 I love the fall asters. They bring so much color to our gardens and countrysides. They also are some of the last nectaring and pollen plants available for the insects — the butterflies, moths, bees and flies — that we so intently watch as they go about their busy lives. Later on they are a good seed source for birds and small mammals. 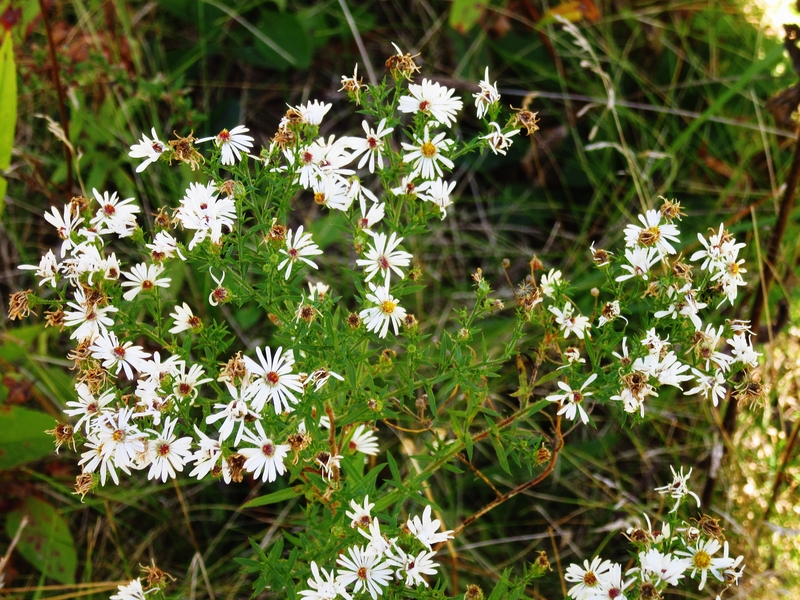 The Skyblue Aster’s (Symphyotrichum oolentangiense) tiny corollas are initially yellow, but later become purplish red and finally brown. The Frost Aster’s (Symphyotrichum pilosum) tiny corollas are initially yellow, but later become reddish purple to reddish brown. 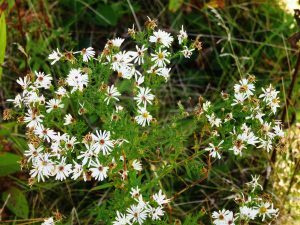 Again, according to Illinois Wildflowers, the daisy-like flowerheads of the Frost Aster are typically “white (rarely light pink or light blue-violet), linear-oblong, and widely spreading when the flowerheads are fully open. The corollas of disk florets are yellow and short-tubular in shape with 4-5 recurved lobes. Later, the corollas of disk florets become reddish purple to reddish brown.” The uniqueness of this aster is the small leafy bracts that grow along the branches. Note: Like most asters, the leaves of these two gradually taper toward their bases where they clasp themselves around the stem. Like many of the asters, when a native plant is in bloom, it often leans to one side because of the weight of the flowerheads. Don’t hesitate to pinch back asters or almost any native plant beginning in June if you wish to control their stature. Native plants are very resilient to storm damage, having evolved with whatever Mother Nature throws at them. So, I believe it’s safe to assume that native plants will typically withstand some simple pruning. P.S. I say this from experience because of my witness to hail damage to native plants in July at the WILD Center in 2010. After cutting back the hail damaged stems, the native plants proceeded to continue growing and produce blooms just as if nothing had happened to slow down their progress.